Native to eastern Europe, horseradish, a funny-looking root, thrives in our climate. This yellowish-brown root belongs to the same family as turnip, cabbage, and cauliflower. The pungent odor and hot taste of horseradish is related to a substance called sinigrin that creates a volatile oil containing sulphur. The release of these properties only happens when the root is either cut or bruised. Grating horseradish will make your eyes water and nose tingle so if you are sensitive, wear ski goggles while grating. Horseradish is popular in many cuisines and is usually served as a condiment for meat, fish, or eggs. The entire root is not useable; you will want to peel the root and discard any woody core. 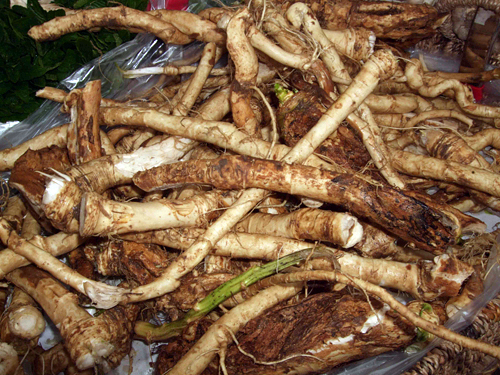 The grated root can be eaten raw but is usually toned down with some dairy product or mixed into a sauce. Horseradish is often served as a sharp relish to accompany roast beef, but also goes well with fish, eggs, apples, and potatoes. One root is usually more than enough for a recipe, so preservation is important since once horseradish is cut or grated and the flavor has developed, it quickly deteriorates. Horseradish should be refrigerated, wrapped in a plastic bag, and peeled before using. Pickling horseradish or storing it with vinegar are two ways to preserve the pungency. Horseradish needs to be peeled before using, and make sure to check for a hard and flavorless core that is not worth grating. Horseradish is often served raw but it can also be cooked before eating. If grated, add it towards the end of cooking, as its pungency mellows with heat. If roasting whole, treat it like roasting root vegetables. For more delicious ideas on incorporating this spicy root into your meal, check out www.saveur.com and search ‘horseradish’.